Cats are so darned adept at hiding their medical issues, often until they are too advanced to be readily fixable. This underscores the importance of a thorough physical examination at least once a year for young and middle aged kitties and twice yearly for seniors. In veterinary school, we are taught to perform a thorough physical examination on each and every patient. It would truly be a shame to miss a new heart murmur or enlarged lymph nodes simply because the chief complaint was urinating outside of the litter box. The sooner abnormalities are detected the more likely you and your veterinarian will be able to achieve good results. 1. Assessment of overall alertness and appearance: Does the cat appear bright, alert, and responsive? 2. Evaluation of gait: Is there any stiffness, lameness, or asymmetry? 3. Evaluation of the skin and hair coat: Are there any areas of hair loss or inflammation? Is the coat lustrous and thrifty in appearance? 4. Assessment of body condition score (BCS): On a scale of 1-9, a number is assigned that indicates whether the cat is underweight, overweight, or just right. A score of 5 indicates an ideal body weight. Numbers 1 through 4 represent gradations of being too thin, and 6 through 9 are gradations of being too heavy. Heart rate: The normal range is 120-160 beats per minute. Capillary refill time: This is the number of seconds it takes for the gum line to become pink after it has been blanched by finger pressure. Normal capillary refill time is 1-1.5 seconds. 6. Examination of the eyes, ears, nose, and oral cavity: Are there any abnormalities observed? Is periodontal disease present? It can be challenging to thoroughly evaluate a cat’s throat. That is because most are not trained to stick out their tongue and say, “Ahhh.” Ideally, examination of the eyes involves an ophthalmoscope, an instrument that provides a more thorough evaluation. 7. Palpation of lymph nodes: Are any enlarged or painful? 8. Listening to the heart and lungs with a stethoscope (auscultation): Are there unusual breath sounds, a heart murmur, or a heart rhythm abnormality? Auscultation should be performed on both sides of the chest. 9. Palpation of the abdomen: Are there areas or discomfort or palpable abnormalities? 10. Palpation of the thyroid glands: Are they enlarged? This is usually the case with hyperthyroid cats (producing too much thyroid hormone). Veterinarians perform physicals differently in terms of the order in which body parts are examined. This doesn’t matter in the least as long as everything is included. And please remember, such thorough exams are not reserved only for the annual office visit. They should be performed at each and every visit. 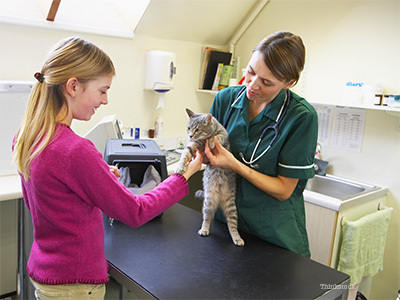 How can you help during a veterinary examination? It helps if you are quiet during the course of your cat’s physical examination, particularly when the stethoscope is in use! Conversing during this exam has the potential to interrupt your veterinarian’s concentration and may interfere with his or her thoroughness. Save your questions and comments for discussion following your cat’s examination. Should I be examining my cat at home on a regular basis? If so, what exactly should I be looking for? Based on your exam, do you think my cat is overweight, underweight or just right? Did you find any abnormalities on my cat’s examination? If so, what are they?